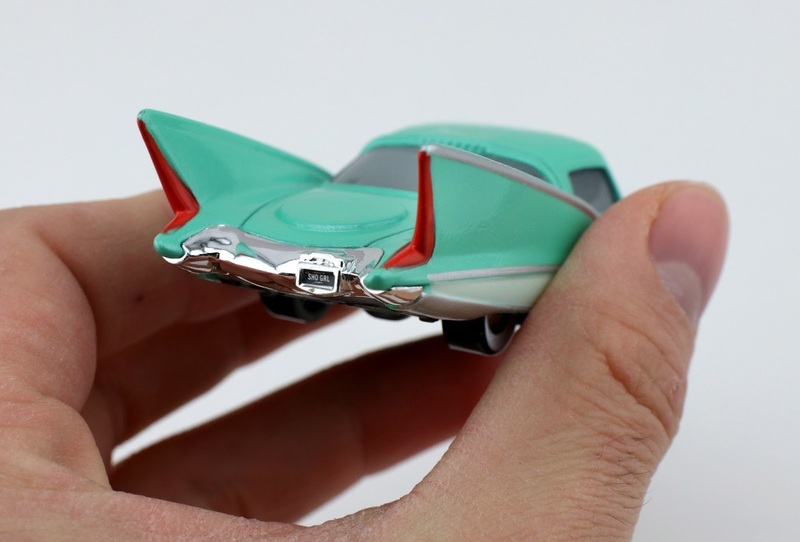 Today I'm reviewing Mattel's latest 1:55 scale incarnation of Flo—my fifth and final review from the new case of Cars 3 2018 Toys R Us "Radiator Springs Classic" diecasts! If you missed my previous posts, you can check out Primer Lightning McQueen HERE, Intro Ramone HERE, Fillmore HERE and Sally with Tattoo HERE. Since 2006, Flo has been released countless times as a single and in multipacks. 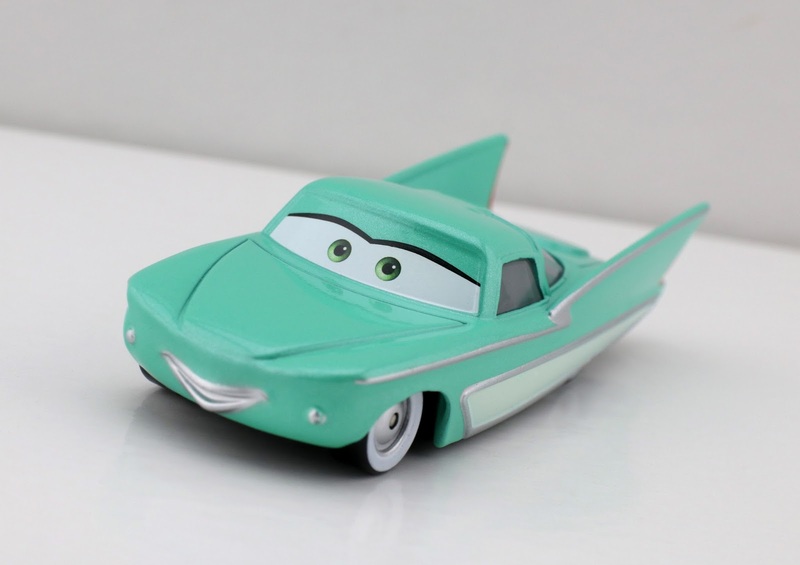 The thing is though, from Cars 1 all the way through the Cars 3 release last year, she was always the exact same mold with rarely ever any changes done to her (some changes in the eyes/brow over the years, but that's it). If you had one Flo, you essentially had them all. 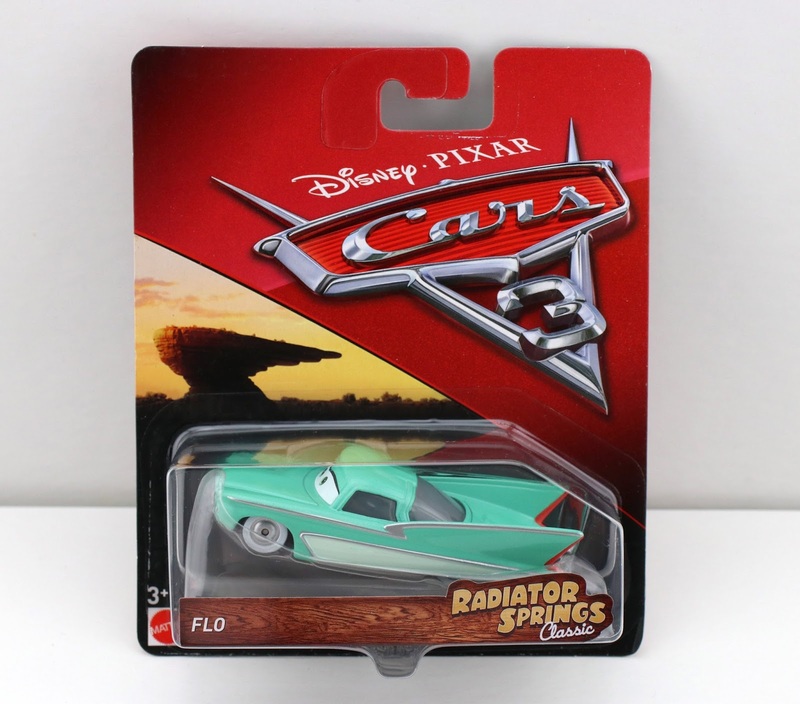 Finally, Mattel has given Flo a massive makeover (what appears to be an entirely new sculpt) and has improved her in every aspect with this new "Radiator Springs Classic" release! Take a look at my loose shots below of this new and vastly improved Flo! See the original 2006 version for comparison in my post HERE. I was about to publish this post, when I realized I knew where my old Flo was! I decided to give you some quick side by side comparison shots taken with my phone so that you could see the changes for yourself. Below (the old Flo is on top), you can see right away that the new Flo is longer and sleeker (with some updated/improved coloring). All her side detailing is thinner and more precise as well. In the next two photos, the old Flo is on the left. You can see that the new one has nicer, thinner taillights and the back trunk area is a tad more angular. The new one also has less clumpy lips and eyebrows as well. Honestly though, it's just nice to have a fresh new Flo that isn't dinged up from over the last 12 years! I'm glad I picked this one up. I didn't realize how many new improvements there actually were (or were needed) until I came home and compared the two. I figured it was just a subtle new expression, but no. This is the Flo to get and is the best single released of her thus far (outside the Precision Series of course), so be sure to snag her if you see her! Check your local Toys R Us for availability and be sure to let me know your thoughts in the comments below.